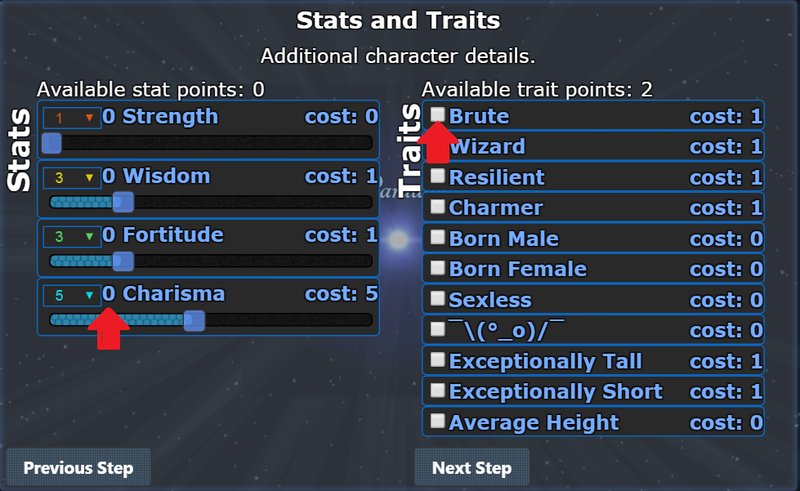 like the title says, directly clicking on the trait-checkboxes doesn't work (clicking on the names does). Also I think the stat sliders should affect the number next to it. Only traits change the number. Can you show a screenshot of how the text is looking for you? I thought I had it in a small enough box to not be affected by lower resolutions. The sliders issue is fixed. There were just a lot of bugs I didn't notice in the last update all caused by one little thing. As soon as it finished drawing a line (or sentence) it readjusts the spacing. The slider issue still looks the same to me, is the fix productive yet? Hm. I don't see that one happen for me. What browser? That particular issue may be unfixable, really, as text layout can sometimes be unpredictable. And I fixed the checkboxes being unclickable.